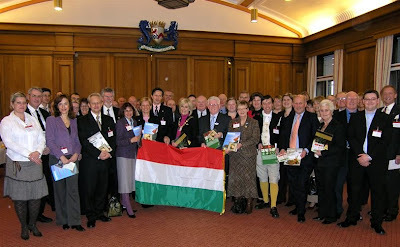 SOUTH Ayrshire Council’s headquarters was the venue for an extravaganza of specialist Hungarian produced food and wine products during a Hungarian trade seminar that was hosted by Provost Winifred Sloan. The Trade Commission of the Embassy of the Republic of Hungary, in association with Ayrshire Chamber of Commerce, ITDH, the Hungarian Investment Trade Development Agency, The British-Hungarian Chamber of Commerce, the Hungarian Agricultural Marketing Centre (AMC) and South Ayrshire Council invited a range of business people to a Hungarian trade seminar. Several speakers addressed the seminar including: Provost Sloan; Tom Drysdale, Hon Consul for Hungary in Scotland; István Varga, Chairman British Chamber of Commerce Hungary; Péter Horváth, Hungarian Trade Commissioner in the UK; Dr Ray Noble, Research Consultant, Giltech Ltd, Ayr and Edit Szabo, Deputy CEO, AMC, Budapest. * tourism-related businesses and tour operators.